Written by Root & Rebound’s Fall Development & Communications Intern, Keerthi Sundaramurthy, this blog describes the inadequacies and shortcomings of our juvenile justice system, and highlights reform and real progress is being made. We invite you to read and comment on this pressing topic! There are over a million cases handled by juvenile courts every year. At any given point during the year, there are at least 70,000 incarcerated juveniles in detention. Every year, the US spends around 21 billion dollars on juvenile incarceration. The juvenile justice system needs reform. From inadequate educational services to lack of mental health support, this system needs to work on the accessibility of these human rights. This system not only does not work to rehabilitate the incarcerated, but may also worsen the situation of crime in society by increasing recidivism. Those in the juvenile justice system experience mental health disorders three times as much as the general youth population. 93% of the youth have been affected by exposure to adverse conditions, including domestic violence, sexual assault, and physical abuse. Programs have been started to implement change. One such program is Models for Change: Systems Reform in Juvenile Justice, a multi-state initiative which has worked to change policies in juvenile systems, to better suit the needs of youth, and make the system more fair, effective, rational and developmentally appropriate. Other programs include Collaborative for Change, which is a multi-dimensional Resource Center that shares information on mental health reforms and provides assistance for those in the juvenile justice system, and Youth Law Center, which is a nonprofit which works to protect children in this system from abuse. Another nonprofit, the Fortune Society, works to provide alternatives to incarceration, and support reentry. The combined efforts of these organizations provide support and aid for those in the juvenile justice system. To read more about mental health and its intersection with juvenile justice, see the Better Solutions for Youth with Mental Health Needs in the Juvenile Justice System report. To see a list of nonprofits working on these issues, see this list made by Philanthropedia. Juvenile incarceration decreases the chances of high school graduation by 13-39% and increases the chance of incarceration as an adult by 23-41%. Even with shorter incarceration durations, the impact can be significant– incarcerated juveniles are unlikely to resume schooling. They also are more likely to develop behavioral/emotional disorders. It is predicted that less than 15% of the kids in the juvenile justice system will graduate from high school, and only 1% will go on to college. The juvenile incarceration system neither prevents future crime, nor improves the state of human capital. It is estimated that for every dollar put towards correctional education, we save $5 in the next three years by reducing recidivism. However, participation in educational or vocational programs in prison decreased juvenile offenders’ probability of returning to prison by 43%. The National Academy of Sciences estimates that better education in juvenile detention could save communities between $2 million and $3 million for each student, over the next ten years. As seen by this evidence, correctional education can clearly be a means of breaking out of the juvenile incarceration-to-adult incarceration system that we see so much. Reform is slowly making its way! States are learning the impact of the juvenile justice-culture, and are shifting towards “trauma-based” models, which include training guards to be able to understand disturbed kids better. They are also moving kids from detention into the likes of community-based programs. This has posed many challenges for the authority in disciplining kids, but progress is being made. An Illinois Senate bill, HB 2401, involves the Redeploy program, which provides services including mental health counseling, to juvenile offenders. The HB 2401 bill allows communities to focus the Redeploy program into smaller regions, which would lead to more effective reform. Louisiana and Connecticut are great examples of states leading in positive changes in the juvenile justice system. Louisiana has recently increased the use of research-based behavioral health, and other assessment tools. It also uses The Structured Assessment of Violence Risk in Youth (SAVRY) and have increased the use of evidence based practices, including Functional Family Therapy teams. The access to the services has increased by more than 50% for the youth, and public safety has been improved. Connecticut has created the School Based Diversion Initiative (SBDI), which is a program in which schools report incidents involving youth with mental health needs to, instead of contacting the police. This has had positive results in schools, and has decreased arrests, suspensions, and expulsions from participating schools. Locking up our youth does not make our communities a safer place. Alternatives to incarceration for youth can reduce recidivism by up to 22 percent. Evidence based programs, correctional facilities, higher education, mental health support, intervention programs, and more focus on treatment can have a huge impact on the youth, the community, and on the country as a whole. We need to invest in and believe in reform, and not just prison buildings, to grow out of unsafe communities and the rashly ineffective juvenile justice system. We are proud to announce that since the release of the Roadmap to Reentry: A California Legal Guide, on May 29, 2015, we have shipped over 900 guides! 50% of those have been delivered to men and women who are currently incarcerated inside California’s prisons and jails. As the word about the guide has spread across institutions, Root & Rebound’s team now receives between 120-180 requests a week from prisons and jails alone. Because the Roadmap to Reentry guide is one of a kind resource created to support people in reentry, those preparing for release, their loved ones and supporters, requests have come from across the State of California, and in other states including Nevada, Arizona and Massachusetts. We need your help to ensure that we can get these guides into the hands of the men and women who are determined to make a fresh start! Our team needs help with the shipping of this guides, such as stamping large envelopes, scanning documents, logging each guide request, and some data entry. That’s why we are launching the “Roadmap to Reentry” community service project as a way of connecting local community volunteers to our much-needed work. Every Tuesday going forward from 12:00pm to 4:00pm, after September 17, in the Root & Rebound office, volunteers can help our team pack and ship the guides across California. Please sign up and volunteer at Root & Rebound and give others this great opportunity at a second chance! We are especially looking for formerly incarcerated leaders to help us grow and sustain this vital project, so that we can continue to meet the growing demand going forward. If you have been in jail or prisons or a family or friend of someone who has, you can take your free copy of the Roadmap to Reentry guide, at the date and time below. If you are able to make it to the very first community service day on Thursday, September 17, 2015 from 12:00pm to 4:00pm, please send your R.S.V.P to cgarcia@rootandrebound.org. The Root & Rebound office is located at 1730 Franklin St. Suite 300, Oakland, CA 94612. If you have any questions or concerns, please contact Carmen Garcia at 510-279-4662. Lunch will be provided. “In some ways, the United States prison system is like a black hole. People get pulled into its gaping rift, and it’s as if they have simply vanished from society for good. By disappearing individuals who have violated the cultural, social, and legal underpinnings of our society, prison does an exceedingly good job of obscuring many underlying social problems and inequities. While families and friends notice the absence of their incarcerated loved ones, many people (without an immediate connection to those on the inside) don’t spend much time actively thinking about what happens to people in prison, let alone what happens after they return from prison. In fact, we are even encouraged not to think about those who have been sucked into the carceral vortex: currently and formerly incarcerated people have been constructed as the societal Other to reject, in contrast with the aspirational figure of the successful law-abiding citizen. By promoting this dichotomy through legal and cultural barriers to reentry, we as a society have set up formerly incarcerated people for failure, vilification, and alienation from our culture and communities. Before this summer, I was pretty ignorant to the specifics of what happens to people after they are released from prison/jail. In fact, I wanted to intern at Root & Rebound specifically because of my ignorance on this specific issue. Over the past several years, I have become more aware of social justice issues, and during this past year in college, I have participated in the Black Lives Matter movement. I have begun to research the historical and contemporary roots of police brutality, mass incarceration, the militarization of law enforcement, and the over-policing of non-white communities. However, much of this education has come from an academic perspective divorced from individuals’ personal experiences. I came to Root & Rebound in hopes of bridging this gap by directly engaging with my fellow community members who are in the process of reentry. I grew up in a relatively privileged environment in Berkeley. While lower income communities and communities of color in Oakland, Richmond, and even within Berkeley are subject to the cyclical oppression and violence wrought by the prison industrial complex, I was able to maintain my distance emotionally and psychologically (if not physically, as well). None of my immediate family or friends have been incarcerated. Until this summer, my most intimate connections to the prison system were the fact that I drove past San Quentin State Prison every day on my way to and from high school and that I visited Alcatraz once to see Ai Weiwei’s art exhibit. I wanted to change this sense of personal detachment. During my internship at Root & Rebound, I have immersed myself in the world of criminal justice and reentry from a more personal, holistic, and community-based perspective. In addition to getting an inside look at the tremendous work it takes to keep a small non-profit up and running, I also learned a lot about the myriad hardships that come along with a criminal record. By reading parts of Root & Rebound’s recently published Roadmap to Reentry guide, attending lectures, and having discussions with formerly incarcerated people and their loved ones, I became aware of the many hurdles to employment, housing, education, and public benefits that formerly incarcerated people have to navigate. I learned about the complicated legal web of restrictions, regulations, and mandates that trap many formerly incarcerated people upon release. During my summer, I have been exposed to many great opportunities: I have had the privilege of listening to the criminal justice-reform speaker Michael Santos, attending a panel (that included R&R’s own Sonja Tonnesen!) about the ADA as it relates to prisons and reentry, and engaging with many fantastic formerly incarcerated people at an advanced film screening of the documentary Life After Life. This summer has taught me innumerable lessons about forgiveness, humanity, and compassion. I made many connections to people involved in advocacy work and started forging inter-community bonds. This summer has made me even more excited about local non-profit advocacy work and has helped me feel even closer to the Bay Area community. This blog post is very special to us. It is a featured interview with our wonderful CYDL high school intern, Dashia Lewis. Dashia has had an incredible personal and professional journey that brings her to this work and we are very grateful to have and learn from her in our office this summer. 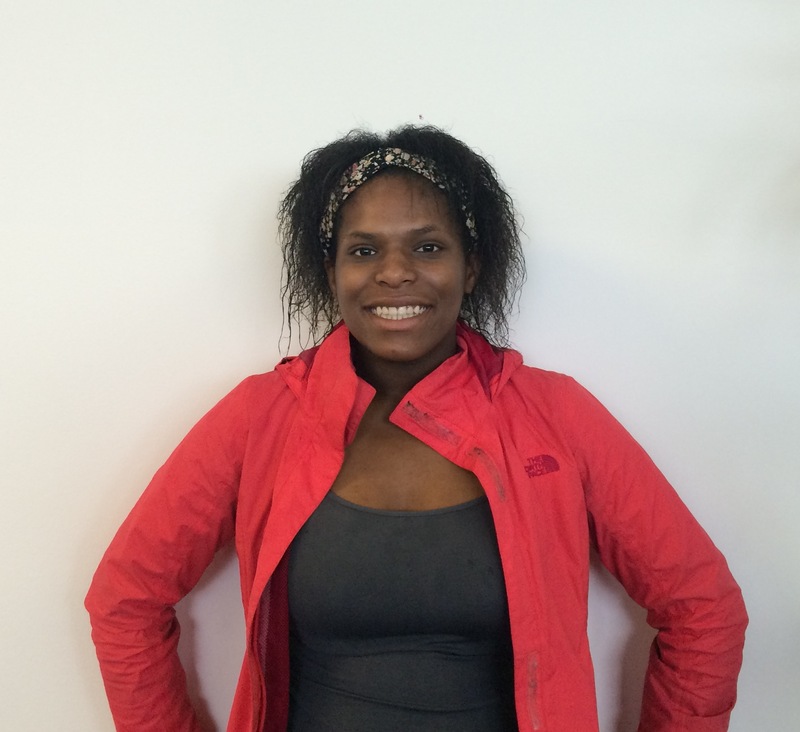 We hope you take the time to read the post and learn from Dashia’s journey. Hello! My name is Dashia. I am a seventeen-year-old Oakland native, and a rising junior year at Hayward High School, where I will be starting in the fall. I attended Fremont High School in Oakland, CA as a freshman and sophomore. Growing up in the Bay Area, in communities of color that have dealt with a lot of different issues, including high unemployment, heavy policing, high rates of incarceration, I have been exploring many of these issues for a long time. Personally I have overcome many obstacles that have interfered with my desire to be a strong local advocate and positive role model and leader among my peers. Right now, as a rising junior, I am extremely focused on reaching my full academic potential, because I want my peers to see that I am a LEADER— someone who set the right examples and committed herself to them. The moral of my story is to not let drama be the common denominator on your path of trying to prepare yourself academically to become the person who you want others to think of when they hear your name and story. This summer, I joined a program called the Center for Youth Development through Law (CYDL), which is a program which directs students who are interested in pursuing a career path in law into different opportunities, such as amazing law-related internships and law classes taught by professionals. As part of the program, law professors prepare us for a mock trial. In that case, I will be playing the role of the defense attorney in a DUI case. I am also gaining many new work readiness skills in the CYDL program, which takes place at UC-Berkeley, School of Law (Boalt Hall), including how to approach people at work, communication skills, and courtroom procedures. I did not know that I would get the position as an intern at Root and Rebound. The students in the program are placed at different sites based on their interests. I had the option to choose the category of internship type that I would prefer to work. My choices were: helping the community and prisoners and justice, which Root & Rebound is all about. Thus far, interning at Root & Rebound has impacted me in a very educational and positive way. 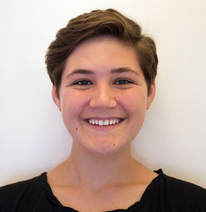 As an intern at Root & Rebound, my role includes compiling research and statistics about racial bias in the criminal justice system; maintaining an online database of contacts affiliated with the organization; administrative tasks and helping with nonprofit accounting. One of my biggest projects at Root & Rebound has been researching community centers to connect to Root & Rebound’s new Reentry Support Cohorts project, which is really enjoyable! WHY DO YOU THINK ROOT & REBOUND’S WORK IS IMPORTANT? Root & Rebound gives people who are incarcerated the resources they need so they can get their rights back and can get out of the criminal justice system. Instead of being seen as criminals, they can now be seen and accepted as full citizens again. Root & Rebound can be a backbone for people who are incarcerated, giving them the support they need so they can become better people who choose to embrace healthier lifestyles. Their work can be life-changing. The “Roadmap to Reentry” guide is a really helpful resource; the team has spent so long on creating a big book full of legal information and tools to help people who are currently and formerly incarcerated. Everything you could need in reentry is in there and for a lot of people it will be their main source of support. Having the guide will help them erase their mistakes and help them get the help they need. Whatever someone is going through, they can find answers. HOW HAVE YOU SEEN REENTRY/MASS INCARCERATION IMPACT YOUR COMMUNITY? Growing up in the Bay Area and living and going to school in both Oakland and Hayward, I have seen mass incarceration, racial profiling and discrimination impact my friends, family members and others in my community directly. If a parent is in jail, it impacts their children. Their children grow up without anyone to tell them right from wrong and without support, which can lead them to make negative choices. When someone does go to jail, it can affect their emotional well-being, they are treated harshly without respect. Also, within the institutions, there are little to no resources available, no job training or rehabilitation, people just tend to wait around, serving their time, which is harmful to them and the rest of society. Also, I’ve seen first hand how communities of color face cyclical discrimination — African Americans, Latinos and other minority groups see their friends and family being targeted by the police more often and as a result spending more time in prison and jail. Often, the police pick up a group of young people and accuse them of being in a gang when that’s not the case. It can feel like its the “police vs. the people” on a daily basis. This discrimination can lead to frustration and resentment within communities, and it can be hard for the police and community members to relate to each other or build positive relationships. We need people of all backgrounds and ethnicities to come together and try and understand each other and the challenges we are facing before things can truly change. WHY ARE YOU SO PASSIONATE ABOUT LEADERSHIP AND HOW DO YOU WANT TO USE LEADERSHIP TOOLS TO SUPPORT YOUR COMMUNITY? During high school, I have been involved in several leadership programs, including the Center for Youth Development through Law (CYDL) who connected me to Root & Rebound. CYDL is a program that connects high school students who are interested in pursuing the law and come from vulnerable communities, with work-based placements across the Bay Area. This program, which combines legal training with work experience, has really helped me develop my advocacy skills and has increased my passion for the law to create social justice change. I have also been part of a few school-based leadership programs, including a program called Real Hard and another called Pass 2. Through these programs, I was able to examine the structural issues that have led to our present-day criminal justice system, from slavery to modern-day discrimination. It gave me the history and the context to the struggles I see everyday in my community and helped me think calmly and carefully about how I can play a part in creating change. I am committed to becoming an example for my peers, to show them there is another way. As we face obstacles that might cause us to give up and decide to take an “easier” path, it is important for me to tell a different story — that we can’t just follow the leader to bad things. That we should push ourselves to rise above the challenges we face and to spend more time in school, preparing for the future, so that we can see our communities thrive. I also have learned that a key ingredient of leadership is not just about rewarding the most successful, the best in the class. It’s also about lifting everyone up along the way. Students who have brought their grades up or have overcome significant challenges should also be recognized and rewarded for their determination and courage despite the odds. I think that is an important part of leadership, supporting and encouraging your peers. I am hopeful that my community can change for the better. Most importantly, I want to see the violence stop, I’ve lost too many friends and family members to violence and anger. I want to motivate people in my community to make better choices or to at least understand why they’ve made the choices they’ve made and what they or we as a society can do differently to support them. In future, I would like to become a lawyer and/or a psychologist — I would use the law as a tool to empower individuals and communities to change the criminal justice system, and I would use psychology to understand the reasons behind people’s individual actions so that they don’t repeat their behavior and can find alternatives. Using my leadership skills and my education, I would like to empower my peers and form a movement to heal my community and see it succeed. 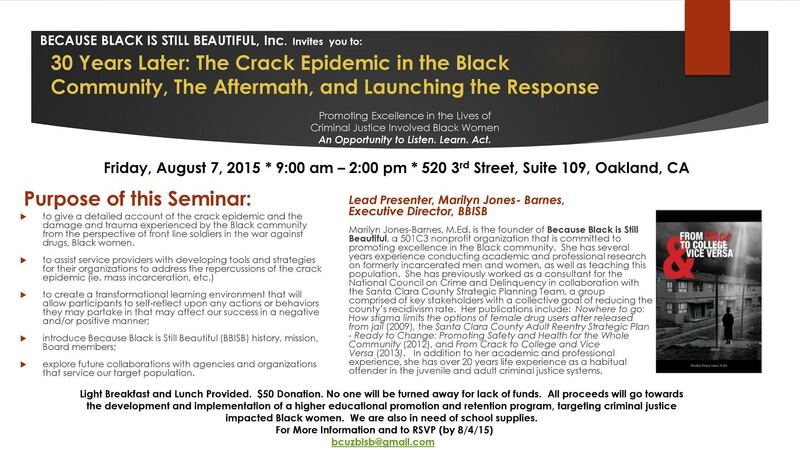 On August 7th from 9:00 am to 2:00 pm, Because Black is Still Beautiful is hosting a seminar entitled “30 Years Later: The Crack Epidemic in the Black Community, The Aftermath, and Launching the Response.” It will focus specifically on the experiences of Black women, which is incredibly timely, given the recent ‪#‎BlackLivesMatter‬ and ‪#‎SayHerName‬ movements. The seminar—led by the fabulous Marilyn Barnes—will give a detailed account of the crack epidemic from the perspective of Black women, assist service providers with developing tools and strategies for their organizations to address the repercussions of the epidemic, and create a transformational learning environment that will allow participants to self-reflect upon any actions or behaviors they make partake in that may affect our success in a negative or positive manner. We hope you are able to attend! Recap of Last Week’s Exciting Criminal Justice Reform News! 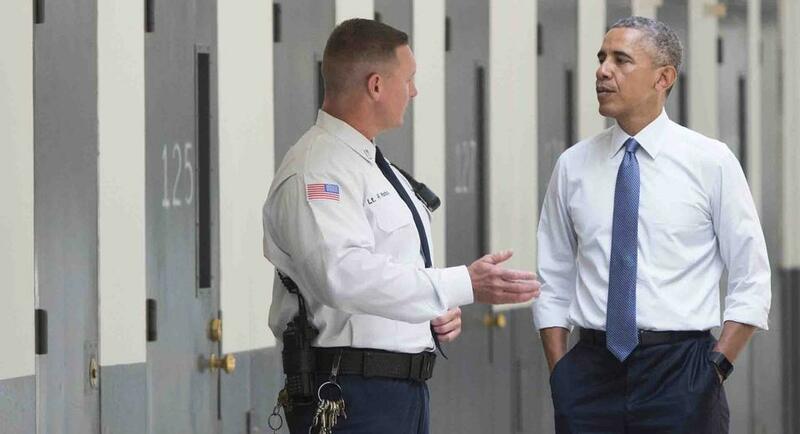 Last week, President Obama paid unprecedented attention to the United States’ prison system. Moving from the “tough on crime” model of the 1960s, ’70s, and ’80s, the Obama Administration has instituted a “smart on crime” model. In line with this shift, the White House focused on sentencing reform this past week. Here’s a brief run-down of some important milestones from Obama’s effort to address America’s prison problem. With these 46 commutations, Obama has now granted clemency to almost 90 individuals, almost all of whom were serving disproportionately long sentences for low-level, non-violent drug crimes. As victims of the harsh sentencing policies that proliferated during the War on Drugs, many of the recipients of these clemency grants would have already served their sentences had they been convicted of the same crimes today. Although this is a major milestone for undoing the damage caused by decades of severe sentences—disproportionately applied to African-Americans and Latinos—and over-policing of low-income communities of color, it is still important to note that these 46 commutations pale in comparison to the massive scale of America’s prison population. Currently, drug offenders make up almost 50% of the country’s federal prison population, which has exceeded 200,000 people. Compared to the 95,165 people currently incarcerated at the federal level for drug-related crimes, the releases of 46 people certainly seems like a less significant step to counteracting the effects of mass incarceration. During his speech in Philadelphia, President Obama called for the full enfranchisement of formerly incarcerated people convicted of felonies. According to The Sentencing Project, about 5.85 million formerly incarcerated people nationwide are ineligible to vote, even though they have served their sentences. Obama also announced that Attorney General Loretta Lynch would begin an investigation of the use of solitary confinement in federal prisons. The unregulated use of solitary confinement—in which inmates are left alone in small cells for up to 24 hours a day—has recently garnered national media attention due to the suicide of Kalief Browder, the New York man who spent three years as a teenager confined at Riker’s Island (including almost two years in solitary confinement) without being convicted of a crime. To watch the full speech, click here. This visit has brought the insides of prisons to the attention of the American public. For many Americans who have never been up close and personal with the inner workings of the criminal justice system, it is a sobering glimpse into abyss of the American carceral state. Obama spoke personally about his own privileges—including a stable education and many opportunities for growth—that allowed him to succeed, and he highlighted that these opportunities were denied to many of the people who find themselves incarcerated for low-level offenses—particularly drug-related crimes. This exciting week in criminal justice should not be underestimated. The issue of prisons has rarely been acknowledged in the public arena, so this attention by President Obama is long overdue. However, it is also important to note that mass incarceration is part of a larger systematic issue. One week of intensive attention will not undo the scope of damage done by racist and unfair policing, the War on Drugs, and Tough on Crime policies. It will take a much larger societal shift to a holistic, restorative criminal justice system in order to right the wrongs of mass incarceration. Sign Up for our ReImagine Workshop! Root & Rebound is co-hosting a FREE empowerment workshop called the “ReImagine Workshop” for people who have been previously incarcerated. Co-hosted and led by Tiffany Younger & Associates’ Social Change Agents Institute, the “ReImagine Workshop” will take place in our downtown Oakland Office, located at 1730 Franklin Street, Suite 300, Oakland, CA 94612, from July 23rd – July 26th (Thursday & Friday evenings, 6-9PM, and Saturday & Sunday all day, 10AM -7PM). Childcare will be provided. If you are interested in signing up, please fill out the RSVP form online by clicking here (max. 25 people). See the attached flyer for more information. The “ReImagine Workshop” seeks to empower and inspire participants to rejuvenate their dreams and find inspiration within themselves to succeed in their careers, relationships, and other personal goals. The workshop includes interactive exercises with a focus on analyzing how experiences of poverty and incarceration have molded the participants’ lives, and gaining new tools and resources to address these issues in the community, to become socially responsible leaders, and to create a life that each person dreams about. Click here to RSVP. Please Note: Max. 25 people. If filled, R&R will maintain a wait-list. Childcare will be provided on all days. Please fill out the RSVP form to give us details about your needs. If you have any questions, please email our Summer Intern, Jennie, at jchenkin@rootandrebound.org, or call the Root & Rebound office at (510) 279-4662 and ask for Jennie.